ISLAMABAD — Landlocked Afghanistan has opened its first direct air link with China, dispatching 20 tons of pine nuts on the inaugural cargo flight. Afghan President Ashraf Ghani and senior Chinese diplomats attended the special ceremony Monday in Kabul, hoping the air corridor will lead to increased Afghan exports of dry and fresh fruits to Chinese markets and address a massive trade deficit. During the past year, Afghanistan has launched air corridors with India, Turkey, Kazakhstan, Saudi Arabia, and Indonesia. A presidential statement said 20 tons of pine nuts will be exported daily to China until the end of the season this year. Beijing is one of the largest importers of Afghan pine nuts. Afghan officials estimate the air corridor would enable them to transport 23,000 tons of pine nuts annually to China, earning up to $800 million in revenue. Ghani described pine nuts, pistachio nuts, and cumin as “the hidden treasures” of Afghanistan, saying the trade corridors would enable the country to utilize its full potential. Afghan businessmen and traders expect raw materials, including saffron and semi-precious stones, which are found in Afghanistan, will also be exported to China through the newly opened link. The Afghan government has been searching for alternate trade routes to reduce dependence on uneasy neighbor Pakistan for international trade. Under a bilateral understanding, Islamabad allows Kabul to use Pakistani land routes and sea ports for international exports. But Afghan officials and businessmen say political tensions and border skirmishes often prompt Islamabad to close major border crossings for days, hampering overland Afghan shipments, mostly containing perishable goods. 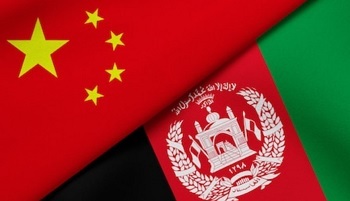 In the wake of its increased economic engagement in the region, China recently set up a trilateral foreign ministers’ level dialogue with Pakistan and Afghanistan to help ease tensions between the two countries and increase mutual security cooperation to fight regional terrorism.